“Stereotype threat” is a very complex and nuanced concept. In simple terms, it is an unconscious response to a prevailing negative stereotype about an identifiable group by a member of that group. 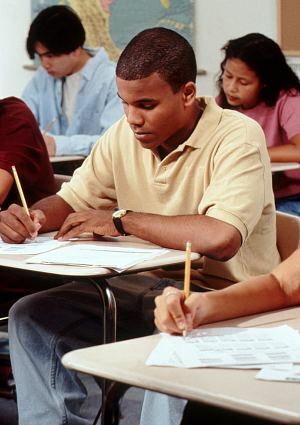 For example: the statistical fact that African American students generally score lower than White students on standardized college entrance examinations like the SAT, ACT and LSAT gives rise to overly-generalized negative stereotypes about the collective cognitive ability of all African Americans when compared to all Whites. An African American student who is aware of this stereotype understands—consciously or unconsciously—that it can have negative consequences on judgments made not only about the student but on judgments made about all African Americans and that these judgments can limit opportunity. So, when confronted with a standardized college entrance examination (typically and incorrectly perceived as a test of cognitive ability, i.e., “intelligence”), the student believes that poor performance on the exam will reinforce the negative stereotype and create negative consequences for all African Americans. In a classic stereotype threat scenario, this fear creates such a high level of stress and anxiety that a student’s cognitive function may be impaired while taking the test and the student may perform below his or her actual ability. Stereotype threat should not be confused with non-racialized and more generalized “test anxiety” experienced by many test takers. For these students, high access to opportunity, generally evidenced by high SAT scores, is cumulative. Access to high performing primary and secondary schools leads to high SAT scores that lead to heightened opportunity to attend selective colleges and universities which leads to greater opportunity to choose a life that “one has reason to value.”6 Despite historic and impassioned prognostications about the public mission of the academy to energize fundamental democratic values including racial and ethnic diversity, it appears that most highly selective colleges and universities use the SAT (or the ACT) as a key component of their admissions strategy. Findings indicate that this is indeed what happened. The tremendous emphasis placed (or misplaced) on standardized test performance in the college admissions process today—especially at highly selective colleges and universities—warrants a vigorous continuing investigation of stereotype threat so that we can mitigate its consequences. If we accept the proposition, as research suggests we must, that stereotype threat is a real phenomenon that can substantially depress the test performance of African American students and other students of color, then we must also recognize the probability that this phenomenon is at least partially responsible for our inability to achieve a desirable level of racial diversity in the nation’s best law schools. All American Bar Association (ABA)-approved law schools require applicants to take the LSAT as part of the admission process.11 In light of recent legal mandates to dismantle affirmative action programs, it is likely that we will see a renewed emphasis on the use of standardized test scores as indicators of future success in the college admissions process. 3 “Official SAT Reasoning Test page”. College Board. Retrieved June 2007. 6 Amartya Sen. Development As Freedom. The Kirwan Institute for the Study of Race and Ethnicity was established in 2003 as a center for interdisciplinary research at The Ohio State University. The Kirwan Institute works to create a just and inclusive society where all people and communities have opportunity to succeed.